We provide the cleaning of floor tiles in the Cheshire area. If you’re considering having your floor tiles cleaned in Cheshire, you’re in the right place. 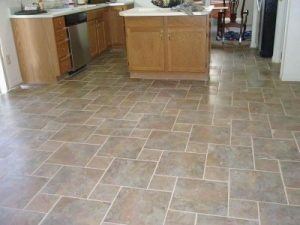 Flooring tiles are one of the most popular walking surface coverings in many households. This type of flooring varies in surface texture from very smooth to uneven to give a stone effect. Most types of ceramic floor tile will not require sealing, however it may be necessary from time to time to to have your floor tiles cleaned professionally by machine to remove the build up of grime and residual cleaning products. The tiles we clean include kitchen floor tiles, bathroom tiles, ceramic and Porcelain floor tiles. If you look towards the edge of of your tiles, you may see the original colour of the grout next to the wall. If your grout is much darker towards the middle of the room or on the walkways, it is a good indication that the tile surface and also the grout is in need of a professional clean. Our deep clean system can in most cases bring it back to the original colour and looking good as new again. The video opposite and image below is of a tiled floor in Cheshire where years of continual use had discoloured the tiles and also the grout. The floor was fitted to a commercial premises many years ago and despite the owners trying many different methods and products, the tile surface had become impossible to clean. Also the uneven the texture of the surface was holding the dirt and grime. We used a very powerful cleaning product and also the use of a floor cleaning machine fitted with an abrasive brush to bring to floor back to it’s original condition. Before and after cleaning of commercial floor tiles opposite. 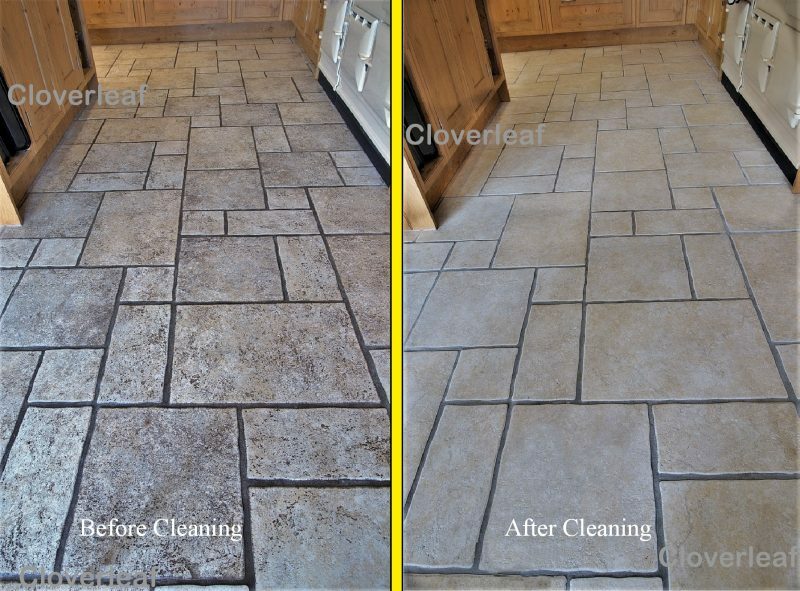 Before and after cleaning of floor tiles in Cheshire. In the image below is part of a large kitchen area. The tiles were heavily soiled and were not able to be cleaned by mopping any more. The floor tiles were cleaned by machine and are now like new again including the grout lines. The result also improved the brightness and lighting of the room. There are several types of Porcain floor tiles. Glazed or polished, porous and non porous, and matt or satin finishes. The grout between the tiles can be cleaned on polished or glazed floor tiles. Tiles which are matt or satin and non porous can be effectively cleaned. Tiles which are porous will require specialist chemicals to remove the dirt from below the surface of the tiles. If you require a friendly free no obligation assessment and quote for your floor tile cleaning in Cheshire, please get in touch. We can visit your property to see what your requirements are and leave you with a quote for your consideration.